Some new findings in Southwest China might help us to locate the ancient capital of the Gouding Kingdom, that was founded by the ancestors of today's Zhuang ethnic minority in China. Now let's take a closer look of the newly unearthed relics in Yunnan Province. 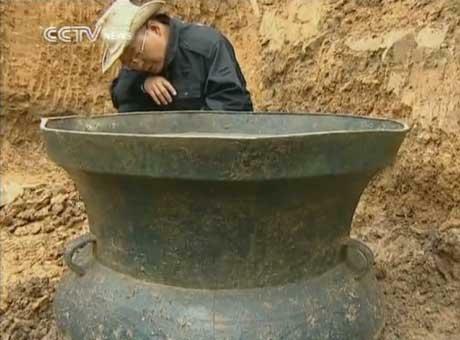 This is the biggest bronze drum that has been found in China. It's about half meter tall and has a diameter of some 70 centimeters. With a history of some two thousand years, the big bronze drum is among a few drums unearthed in the group mausoleums in Muyi village, which is believed to be the location of the Gouding Kingdom. Some 170 precious relics have been found. Most are bronze pieces with a few wares made in jade, agate and iron. Though the wood containers have decayed, the findings saved inside the tombs were preserved well. A gold belt buckle gives further proof of identity of its owner. Yang Fan, expert of Yunnan Archeological Research Inst., said, "There are decorations of dragon and tiger. One is a symbol exclusively used for emperors, and one is for the king in ancient China. The pattern also gives us some clue regarding relations between the Emperor of Han Dynasty and the King of Gouding. " The tribal chief of Gouding was favored as a king of the Han Dynasty by Emporer Wudi in 111 B.C. The kingdom survived for some five to six hundred years. As for the reason behind its fall and disappearance, more underground excavation might help to tell.